Amazon’s announcement that the company would be seeking requests for proposals from cities for a new corporate headquarters has produced one of the most bizarre corporate spectacles of the last decade. The company’s promise of an estimated $5 billion facility and around 50,000 high-paying jobs sent nearly every major city in the U.S. into a pandering spiral. The company received proposals from at least 238 cities, each of whom trotted out their biggest, wildest incentives to draw the company in. Amazon narrowed these to a “Top 20” list in January, naming Atlanta, Raleigh, and Nashville among its top contenders. At present, Atlanta tops the list of many industry predictions about Amazon’s “HQ2” placement. The city boasts a steady stream of technology talent from universities like Georgia Tech and Kennesaw State University, convenient access to an international airport hub, and an attractively low cost of living, all of which Amazon has touted as important factors in its decision. Backers of the city’s bid are hoping that Amazon could bring opportunities for Atlanta. The company claims that its operation in Seattle, where it’s existing headquarters is located, has brought at least an additional $38 billion to the city’s economy since 2010. The company’s $500 billion market share and the average $100,000 annual salary of HQ2’s new 50,000 person workforce could potentially generate a similar bump for Atlanta. State and city leaders have spoken in great detail about the specific benefits they see in bringing Amazon into Atlanta, and Gov. Nathan Deal and Atlanta Mayor Keisha Lance-Bottoms have both backed the city’s bid. But while HQ2 could bring some impressive new economic opportunities to the city, there are also drawbacks: namely, that the company’s presence could speed up the affordable housing crisis, and could impede efforts to expand transit options in the city. Some worry Atlanta’s racial identity and culture will also be threatened. Seattle, where Amazon currently has a headquarters, has seen its median rent prices increase at about three times the rate of the rest of the country. Tanya Washington has been following Atlanta’s Amazon bid with intrigue since last fall. Washington, a professor at Georgia State University College of Law, tends to approach issues wearing both her academic and active citizen hats. The promise of Amazon’s potential to drive investment in city education and infrastructure seemed encouraging to Washington, but she found herself thinking more and more about how the move could affect her neighbors. “As this started to become more of a possibility, I started to search just around the impact that [Amazon] had in Seattle on affordable housing, and wages, and the economy, and the widening of the gaps between with the have-mores and have-not-enoughs,” Washington said. What she found wasn’t promising. Seattle has seen its median rent prices increase at about triple the rate of the rest of the country. Median home values in Seattle have shot up about 85 percent since 2010, which benefits some homeowners and real estate investors, but creates major barriers for low-income residents. Some have linked Amazon’s expansion within Seattle to the city’s growing homeless population. It’s also personal for her: Washington has lived in the downtown-adjacent Peoplestown neighborhood since 2011. “Not a week goes by that I don’t get one of those little flyers that say, ‘People are interested in buying your house, we’ll pay cash,’” she said. These are schemes that typically prey on homeowners in financial distress by offering to pay much lower cash values in exchange for homes that are likely worth much more on the market. Washington and her neighbors have been embroiled in a battle with the City of Atlanta over the last few years to retain their homes. The city insists that it needs the land to deal with ongoing flooding, although some believe the area is being groomed for private development. The contenders have publicly offered tax incentives as big as $7 billion, and as long-standing as 10 years. This strategy overall has come under a great deal of scrutiny, with many concerned that cities are losing critical tax revenue with little chance of recouping it. She fears the Amazon headquarters would pile onto the city’s existing issues with home pricing and gentrification. 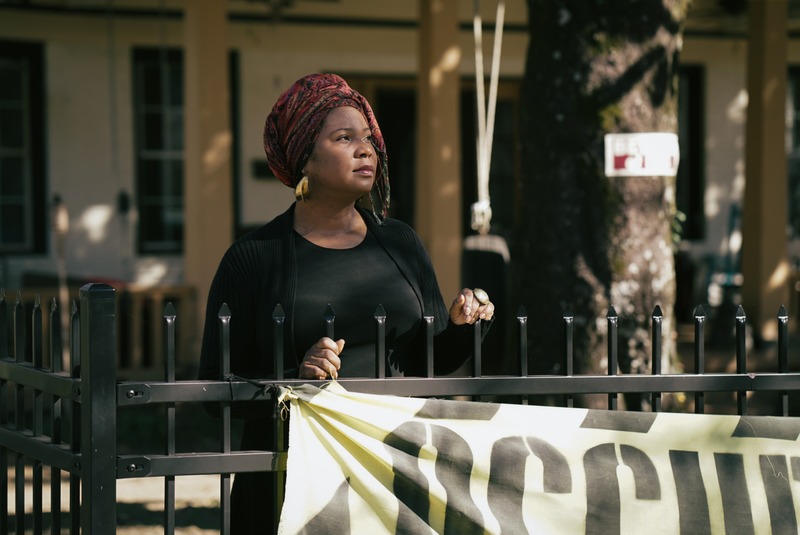 In 2015, one in five rental homes in the city received an eviction notice, and more recent research finds historic Black neighborhoods near Atlanta’s Beltline are vulnerable to displacement. “I don’t think we’re prepared to deal with it. We weren’t prepared to deal with the displacement that’s resulting from the development that’s taking place right now,” Washington said. Research compiled by rental listing company Apartment List found that Amazon’s HQ2 would likely spike rent growth in every city on its Top 20 list. Atlanta’s rent growth, the report found, would be driven by the arrival of a new set of high-wage workers earning well above the city’s median income of $36,340. Sydney Bennet, senior research associate with Apartment List and author of the Amazon report, explained that while Atlanta already has a fair amount of housing that could accommodate Amazon’s 50,000 person workforce, new developers are likely to cater to a higher income bracket than Atlanta is used to. “If you have a lot of high-income renters coming in, a lot of that housing will be more luxury, especially in a metro where the current medians are so much lower than Amazon,” Bennet said. Current speculation from the Atlanta Business Chronicle and others is that Amazon would look to build its headquarters in “The Gulch,” a former rail corridor in downtown Atlanta. Los Angeles-based developer CIM Group submitted a proposal to the city in January to develop the space according to Amazon’s expected building specs and expected timeline. Should that prove to be true, downtown neighborhoods like Peoplestown, Pittsburgh, and Summerhill are likely to see an influx of wealthy, Amazon-employed home-buyers looking to avoid the traffic out to high-income suburbs. Property taxes and rents would rise accordingly. Transit advocates see another issue with Amazon’s potential move into the Gulch. The rail lines in the Gulch are a critical infrastructure for potential expansions of Atlanta’s rail system. Amazon has said that public transit offerings are a key consideration for its HQ2 decisions, which could be a positive: Lee Biola, president of Citizens for Progressive Transit, thinks Amazon could spur Atlanta to invest more seriously in its public transit system. Developing the Gulch for Amazon, however, could hinder opportunities for both metro and commuter rail expansion simply by taking up key space in the city. Washington says this isn’t just about a racial identity, but a cultural identity for the city. “There’s some risk that the buildings could take the place of multimodal train station, and even more concern that some of the buildings would block some of the rights of way for rail that could exist,” Biola said. Developers could potentially work around the rail infrastructure, or work the rail system directly into the site. But while developer plans for The Gulch have described the site as “transit-oriented,” at present they do not include plans for commuter rail access. “It would be a shame if we were the generation that would allow that right of way to get locked,” Biola noted. Biola is also wary that the city’s strategy of offering tax incentives used to lure Amazon could detract from transit and other city infrastructure incentives. The top 20 cities have publicly offered tax incentives as big as $7 billion, and as long-standing as 10 years; privately, they may have offered more. This strategy overall has come under a great deal of scrutiny, with many concerned that cities are losing critical tax revenue with little chance of recouping it. Torres was unable to comment on whether that $1 billion figure Reed promised would remain firm. Indeed, Gov. Deal announced in January that should Atlanta make the next cut for Amazon’s HQ2 list, he will call a special legislative session to allow lawmakers to pass even more tax incentives to attract Amazon. Amazon’s move to Atlanta could also have a dramatic effect on the city’s already-changing demographics. Amazon has not disclosed specific diversity statistics for its technology jobs, but its full workplace demographics skew white and male, especially in leadership positions. Fifty thousand new Amazon workers could add to existing trends in Atlanta, which has seen one of the fastest rates of growth in its white population of any major metro city in the country.